The Atascadero Area Subbasin of the Salinas Valley Groundwater Basin is designated by the Department of Water Resources (DWR) in its Bulletin 118 as Basin No. 3-004.11 (locally referred to as the “Atascadero Basin”). The Atascadero Basin is located in northern San Luis Obispo County and lies along the Salinas River, extending from Santa Margarita in the south to Highway 46 in the north. In 2014, the State legislature approved a new groundwater management law known as the Sustainable Groundwater Management Act (SGMA). SGMA requires that high and medium priority basins comply with the new law. At that time, the Atascadero Basin was still part of the Paso Robles Area Subbasin which was a high priority basin. 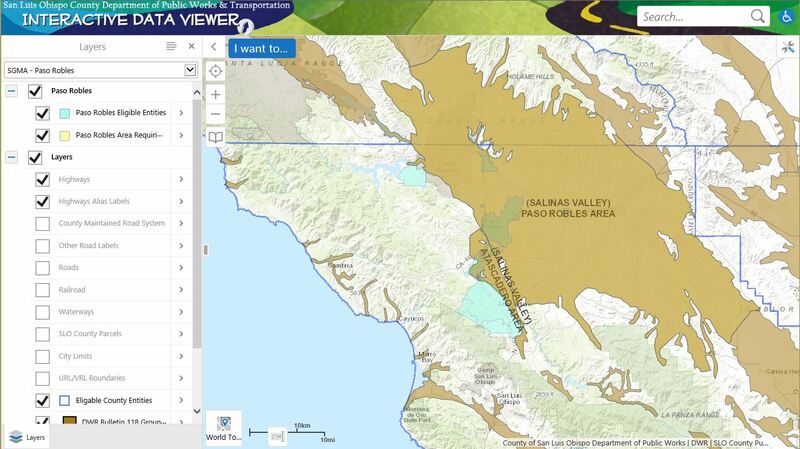 In 2016, the Atascadero Basin was divided from the Paso Robles Area Subbasin based on information that shows the Rinconada Fault is a significant barrier to groundwater flow. The County of San Luis Obispo, Templeton Community Service District, City of Atascadero, City of Paso Robles, Atascadero Mutual Water Company, and others have entered into a memorandum of agreement creating a groundwater sustainability agency (GSA) for the Atascadero Basin in accordance with SGMA to prepare a groundwater sustainability plan (GSP). 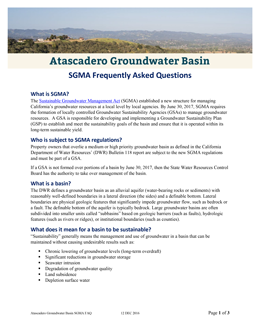 In May 2018, DWR designated the Atascadero Basin as a very low priority basin and therefore no longer required to comply with SGMA. 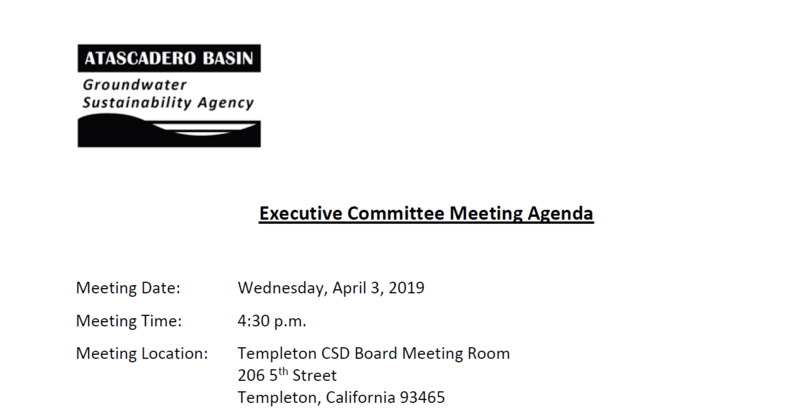 However, the GSA decided on October 3, 2018, that it will continue to proactively manage the groundwater resources in the Atascadero Basin and move forward with the development of a GSP using grant funds provided by DWR. 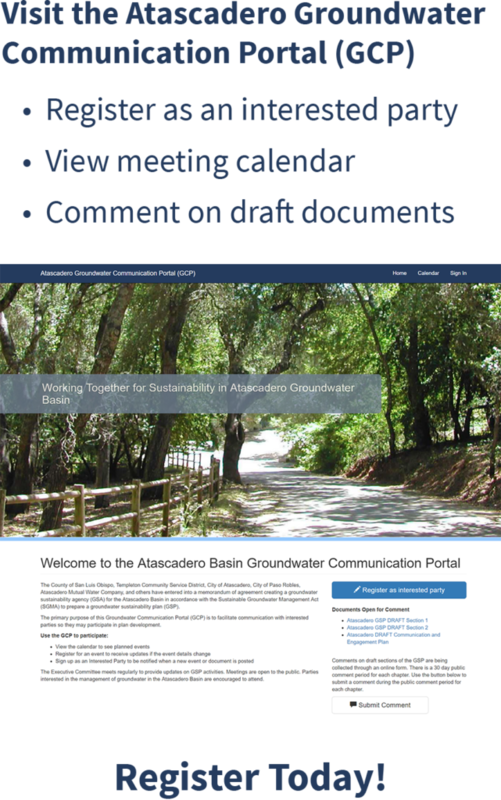 Please join us in our effort to develop a GSP to manage our precious water resources in the Atascadero Basin.